The past decade has seen the 1950s military base transformed into one of the city’s newest suburbs — townhouses and boulevards replacing abandoned or decrepit military buildings. There’s still a lot of history there, enough to draw the Edmonton Paranormal Society out to use the base to hone their paranormal skills and sensitivities of its members. Griesbach has one of the key features of most ghostly haunts: A lot of people have come and gone over the years. No obvious historic stories tie the hauntings to Griesbach, but researchers have been called to homes in the area by residents encountering spirits more “aggressive” than usual. Instead of flickering lights, residents have reported objects being thrown. When I look at this picture of Griesbach in whatever year it was photographed I find it to be very disorienting. I know for certain that the military buildings in the foreground (bottom side of the photo) is being viewed from the west ( top side of the photo) looking toward the east. The PMQ houses in the distance are obviously the "Old Section" which was at the south east corner of the base.So the south direction would be on the left side of this photo and north would be on the right side of this photo. The building about 3/4s of the way along the right side of this photo is Griesbach Number One school which is shaped like a backwards capital L in this picture with the bottom edge of the backwards L facing north. However, the entire region containing the PMQs is incorrectly oriented as if it was pasted on to produce an incorrect composite photo. The entire PMQ houses including the empty field just north of them represents a view of them taken from the east perspective with the east in the foreground and the west in the distance. The curve of PMQ houses seen in this photo to go "east" and curve north should actually come from the east and curve closer toward the north. The Snack Bar quonset hut would be at the very north tip of that curve of PMQs. So,in my opinion this picture is actually a composite of at least two photos with incorrect orientation. Also,there are many missing military buildings that should appear but do not. Perhaps this was originally photographed from a time much earlier than 1957-1958. Whether or not this photo was diberately made this way is a matter of conjecture. I stll remember vividly standing outside the entrance of the Snack Bar quonset hut which had an all gravel parking entrance and knowing that the large military buildings shown in this photo were located to the west of me and that curve of PMQs stretched south and east of me with the Griesbach No. 1 school just northeast of me toward 97 street along the east side of the base. Great post. Inspires me to share this: I am one of those Canadian "army brats" too. My father signed up in 1958 with the RCR (Royal Canadian Regiment) as a regular soldier and eventually made his way into "food services." He retired in 1987. We travelled west as far as Winnipeg, Manitoba (1970). I always looked forward to moving into the military family houses, those "PMQs". In 1968, we lived in military family quarters known affectionately as, "The Dog Houses" in Downsview, the Greater Toronto Area (Scarborough?). 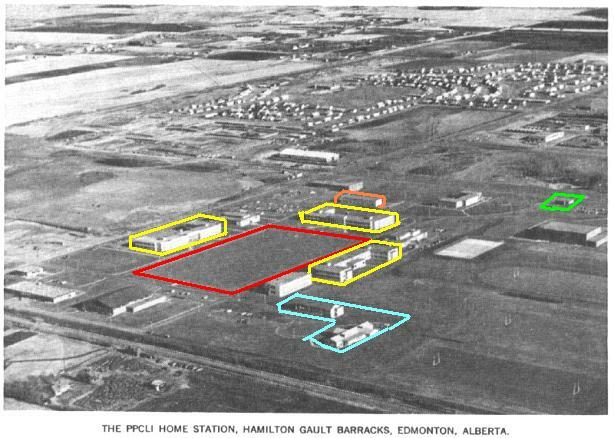 I lived on the former Griesbach Army Base (which was usually called the camp) in a PMQ (Private Military Quarters) duplex house located at 10228-140 Avenue in the west half of the duplex in the "Old Section". Our backyard was on the north and our front yard was on the south along 140 Avenue. I attended the Griesbach Number One School which was north of where we lived from about September 1957 to March 1964 (i.e.kindergarten to Grade 6). We were a Roman Catholic family therefore we attended the base Roman Catholic church which was further north of the school. My dad held the rank of Sargeant in the RCAPC (Royal Canadian Army Pay Corps) working as an office pay clerk. He used to bring home many used Canadian postage stamps for me to collect. I still have most of those old postage stamps.